When the necks grip must be renewed, this process is called neck graft. It is called this because the peg box is shafted with the scroll shafted here. 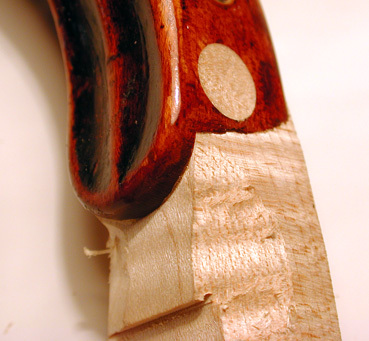 This repair is costly and is necessary when the violin neck has been broken, though a neck length that is either too long or too short would also require this type of work. To carry out a scroll graft, a cutout is made into the peg box where a piece of ripened maple is fitted with perfect precision.